Eating disorders affect approximately 10% of the population (Stice, Marti, & Rhode, 2013). Despite this, effective treatments for eating disorders are extremely limited. The empirically supported treatments for binge eating disorder and bulimia nervosa have relapse rates estimated to be as high as 50% (Olmstead, Kaplan, & Rockert, 2005). Additionally, the only empirically supported treatment for anorexia nervosa is for adolescents, meaning there are no effective treatments for adults with anorexia nervosa. Our lab is working hard to try to fill this need by researching new interventions for treating eating disorders, such as imaginal exposure therapy and personalized treatment for eating disorders. Because treatment interventions for eating disorders are currently not as advanced as we would like them to be, eating disorder prevention is even more critical. Prevention and early detection of eating disorders has the potential to drastically reduce the high prevalence of eating disorders, and thus, reduce the number of individuals who struggle with treatment-resistant eating disorders. Our lab has recently been trained in the Body Project, which is a dissonance-based eating disorder prevention program. We are very excited to disseminate this program around Louisville and on University of Louisville’s campus to help reduce the burden of eating disorders on our community. The Body Project was first developed by Dr. Carolyn Becker, a professor at Trinity University in San Antonio. She first implemented the college version of the Body Project in collaboration with Delta Delta Delta Sorority, and the program quickly expanded to several colleges around the nation. The purpose of the Body Project is to inform young women about the “appearance ideal,” which is the “perfect” appearance, as promoted by society, which is often unrealistic and unattainable. After discussing this ideal, participants then brainstorm the costs of pursuing this unattainable ideal and learn skills and activities they can do to act and speak against this ideal. This intervention has shown to be effective in reducing eating disorder symptoms, thin ideal internalization, and body dissatisfaction in young women (Stice et al., 2013; Stice, Rohde, Gau, & Shaw, 2009). Additionally, individuals at the Body Project are also working on developing and validating new versions of this intervention for different groups, including cultural minorities, non-English speakers, males, and middle school students. This could allow for the Body Project to reach more people across the world and prevent eating disorders in more individuals! Two versions of the intervention that we currently have in Louisville are the 4-session high school version and the 2-session peer lead version for college students. The high school version in Louisville is conducted in four one-hour sessions and takes place during the school day as part of the health class curriculum. So far, the Body Project has been conducted at Mercy and Presentation Academy in Louisville. In an investigation of the effectiveness of the Body Project in these Louisville high schools, we found that the Body Project reduced eating disorder symptoms, body dissatisfaction, as well as many other eating disorder risk factors and comorbidities, including anxiety, depression, and maladaptive perfectionism (Christian et al., 2018). This upcoming year we are planning to expand this program even more, and there is currently a call for interested individuals to become a trained facilitator of the high school version of the Body Project. If you are interested in attending a training event, please reach out to melliottcahill@gmail.com for more details on the training and the Body Project. 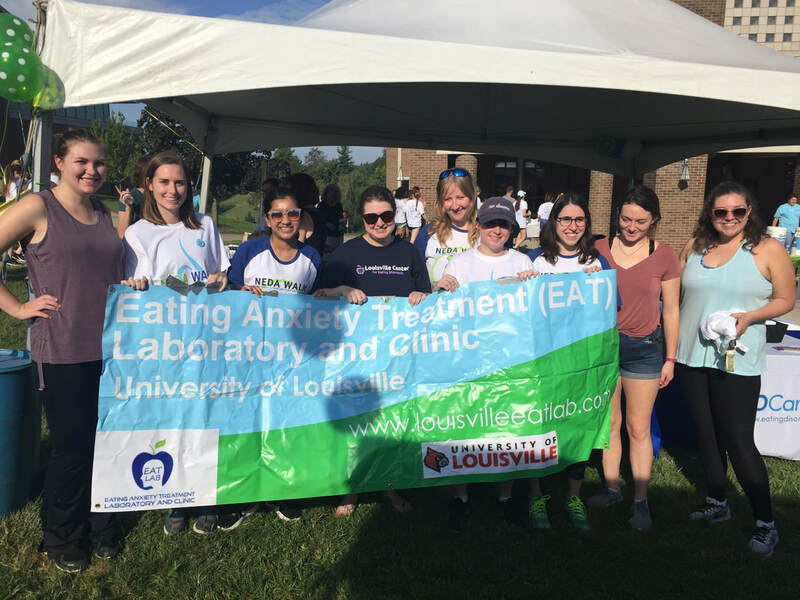 This January, a group of students and professionals from the Eating Anxiety Treatment (EAT) lab, the Louisville Center of Eating Disorders, and the Psychological Services Center underwent a training for the peer-led version of the Body Project, so that we can start disseminating it to college students at the University of Louisville. We have already done a few sessions of the Body Project on campus in collaboration with the Women’s Center, and they were very successful. This semester, we are planning on expanding the reach of the Body Project at UofL by turning it into a Registered Student Organization (RSO). We hope that this RSO will allow for students who are passionate about eating disorder prevention or spreading body positivity on UofL’s campus to get more involved, as well as create a sustainable model of disseminating the Body Project on campus. In addition to doing the peer-led Body Project with interested groups, we also hope to spread a body positive message that could change the campus culture around body image by partnering with other groups to promote external events and initiatives. If you are interested in being part of this new RSO, please contact bodyprojectlouisville@gmail.com to learn more about the RSO or to RSVP for the peer-led Body Project facilitator training. We are very excited to bring the Body Project to Louisville to help increase awareness and prevention of eating disorders in our community and on the University of Louisville campus! We hope that through disseminating this intervention, we will spread a body positive message to more individuals and decrease the number of friends, family members, and neighbors that struggle with eating disorders in our community. Christian, C., Brosof, L. C., Vanzhula I.A., Williams, B. M., Shankar Ram, S., Levinson, C. A. (2018). The Efficacy of a Dissonance-Based Eating Disorder Prevention Program in the Reduction of Eating Disorder Comorbidities and Risk Factors in High School Students. Manuscript submitted for publication. Stice, E., Marti, C., & Rohde, P. (2013). Prevalence, incidence, impairment, and course of the proposed DSM-5 eating disorder diagnoses in an 8-year prospective community study of young women. Journal of Abnormal Psychology. 122(2), 445. DOI: 10.1037/a0030679. ​Upon hearing about the experiences my lab had at the 2018 International Conference on Eating Disorders in Chicago, Illinois, we discussed the controversial nature that exists when researchers use “triggering,” terminology. Audience members became upset with certain researchers who used words such as “overweight,” and “obese,” which were used to describe study participants. These words have been part of the terminology present in fat-shaming, fat discrimination, and micro aggression towards a population that society has deemed to have above average weight. Furthermore, these words become associated with individuals that society has frequently labeled as “lazy” or “incapable” as dictated by their portrayals in films, television, and other media outlets. However, this begs the question: Should researchers use these words if they are so triggering in the public domain? The answer is complicated. “Obese,” comes from the latin “obesus,” which means “fat, stout, plump.” It was believed that Hippocrates recognized obesity as a medical condition as it gave rise to the onset of other diseases (Christopoulou-Aletra & Papavramidou, 2004). The modern term “obesity,” one that became stigmatized by society today, took shape in 1942, when The Metropolitan Life Insurance Company began to determine mortality rates based off of age and weight. For the first time, individuals were standardized and the notion of what an individual “should” weigh was popularized (Statistical bulletin of the Metropolitan Life Insurance Company). While initially designed to determine “desirable weight” dependent on age, height and mortality values, the insurance company changed the medical term into one that society was able to pass medical judgment on, completely discounting the innate nature in which all bodies are different. Researchers Meadows and Danielsdottir (2016) said it best, “Part of the problem is that the very act of labeling is a process of othering, one that creates a distinction between us and them; which raises the question: who is entitled to do the labeling and why, and in what conditions is such a distinction needed?” Within research, othering is needed in order to determine differences between two groups of individuals. However, when presenting research, the two groups must be labeled in order for other researchers to understand what populations the research is being done on. The questions Meadows and Danielsdottir (2016) raise are both legitimate and further contemplation could give rise to an ethics paper worth developing. However, I argue, researchers ought to be allowed to use the triggering word, upon critical consideration, as long as its intent is to use the word as it originally appeared in the dictionary and not one that was shaped from societal norms. I recognize this statement contains many caveats, like “what if the word in the dictionary was created offensively in the first place?” It is the responsibility of researchers to develop a common word that can be used for research purposes. Let’s say for instance, researchers were to change the word of a specific demographic every time social norms dictate it as “triggering.” Not only would this be a disservice to the population in which the research was presented on, but also could have a negative impact on the research itself. For example, if researchers cannot come up with a common language for the subject in which they are communicating, then the ability to share research will be dependent on how long the terminology within that research is deemed “acceptable.” For this reason, when reporting on demographics, researchers ought to be careful in the first place of the terms they do use. In the end, I believe that “obese” as a research term ought to continue to be used, reporting results unbiased without regard to social norms. Further, if new information comes to light, for example if it was discovered that Hippocrates used “obese” as a derogatory term, then it is the ethical responsibility of researchers to utilize different terminology for this demographic. ​While the culture in the United States has come a long way in terms of normalizing and destigmatizing mental illness, particularly with respect to depression and anxiety, there are still a lot of misconceptions and stereotypes surrounding other mental illnesses, such as eating disorders and obsessive-compulsive disorder. Eating disorders, and mental illness in general, is still a taboo topic in a lot of communities, specifically among people of color. As an Indian-American, I have witnessed the culture surrounding mental illness within my community. Rather than being seen as a real illness that warrants the same attention and level of care as a physical ailment, mental illness is often dismissed and not legitimized. Even when one’s mental illness is acknowledged, their family might try to explain it by giving it a biological cause, such as rationalizing it as a thyroid dysfunction. Due to a myriad of sociocultural factors, South-Asians face unique barriers to seeking treatment for eating disorders. One issue is that eating disorders are still stereotyped as an issue that only affects young, affluent, White women. In reality, eating disorders affect people of all genders, ethnic groups and ages (Marques et al., 2011). While extensive research on eating disorders has been conducted in European-American populations, and some research has been conducted in African, Latin-American, and Hispanic populations, eating disorder research has been historically sparse in Asian populations (Soh & Walter, 2013). Research has suggested that referrals to eating disorder services from South-Asian populations are under-represented (Abbas et al., 2010), despite evidence suggesting that rates of disordered-eating behaviors are similar to the rest of the population (Wales et al., 2017). Studies have also shown that there is a high prevalence of disordered eating behaviors in minority populations in general (Solmi et al., 2014), and research in South-Asian populations have suggested that the incidence of certain eating disorders, specifically bulimia nervosa, is higher in South-Asian populations than White populations (Mumford et al., 1991). Eating disorders are particularly relevant in the South-Asian community due to role that food plays in the culture. Any large gathering of family or friends usually involves a lot of sugary, fatty food, and people are encouraged to socialize and eat, and those that do not partake are seen as asocial. However, it is also a common occurrence in the South-Asian community to have various relatives or family friends comment on various aspects of one’s life, including one’s physical appearance. In the Indian community, being light-skinned and thin are seen as not just sufficient, but necessary to be considered attractive, if you are a woman. Societal pressure in the form of comments or suggestions are often made if a woman does not match this ideal body type, conditioning individuals to go to extremes pursuing this ideal. Research has found that this is a common theme in the South-Asian community that can prime individuals to develop disordered eating habits and behaviors (Wales et al., 2017). Much of this pressure is faced by young women and adolescent girls, as patriarchal norms dictate that they are expected to look attractive to find an ideal husband. Men in the South-Asian community also face the same societal pressures, but generally to a lesser extent. Older women often note that they do not face the same pressures after marriage, though some pressures still exist. This dual pressure to eat in social settings and yet maintain a thin figure may be one reason why there is a higher than average prevalence of bulimia nervosa in South-Asian women, and why anorexia nervosa might not be as common (Mumford et al., 1991; Abbas et al., 2010). Klump and Keel (2003) also provide other explanations on cultural differences in eating disorders, and their research has found that bulimia nervosa has greater variability cross-culturally than other eating disorders, such as anorexia nervosa. Additionally, women who are part of the South-Asian diaspora, but who live in the Western world face experience many conflicting messages about food and weight, as they are exposed to more traditional South-Asian influences from their family, as well as being exposed to various Western disordered eating triggers such as peer pressure, pictures of thin celebrities and pro-anorexia websites. Not only do South-Asians face unique sociocultural pressures that may contribute towards disordered eating, but they also face barriers to seeking treatment. One of the biggest barriers to accessing services is lack of knowledge – while younger South-Asians tend to be more aware and exposed to ideas about mental illness, they may be dismissed by elder family members or friends. The lack of communication and understanding of the seriousness of eating disorders can keep younger South-Asians from accessing care, particularly if they are dependent on family members to assist with paying for treatment (Wales et al., 2017). This goes along with the general stigma surrounding mental illness in the South-Asian community – seeking treatment involves acknowledging the mental illness, and many South-Asians do not want to admit that there is a “problem” in their family or community. While South Asian populations face these unique barriers to accessing care for eating disorders, progress is still being made. Mental health is being discussed in a serious way in South-Asian media, such as in Bollywood movies, reshaping the way it is viewed by the general population. However, increasing eating disorder research on this understudied population is important, as it could contribute towards reducing barriers to treatment and improving quality of care to the South-Asian population. Moreover, eating disorders may present differently in Eastern populations versus Western populations, so more research needs to be done to parse out if such differences exist. Additionally, normalizing topics within these communities is essential, as stigma can keep South-Asians from accessing mental health services, even when readily available. Abbas, S., Damani, S., Malik, I., Button, E., Aldridge, S., & Palmer, R. L. (2010). A comparative study of South Asian and non‐Asian referrals to an eating disorders service in Leicester, UK. European Eating Disorders Review, 18(5), 404-409. Keel, P. K., & Klump, K. L. (2003). Are eating disorders culture-bound syndromes? Implications for conceptualizing their etiology. Psychological bulletin, 129(5), 747. Marques, L., Alegria, M., Becker, A. E., Chen, C. N., Fang, A., Chosak, A., & Diniz, J. B. (2011). Comparative prevalence, correlates of impairment, and service utilization for eating disorders across US ethnic groups: Implications for reducing ethnic disparities in health care access for eating disorders. International Journal of Eating Disorders, 44(5), 412-420. Mumford, D.B., Whitehouse, A.M., & Platts, M. (1991), Sociocultural correlates of eating disorders among Asian schoolgirls in Bradford. The British Journal of Psychiatry, 158(2), 222-228. Soh, N.L. & Walter, G. (2013), Publications on cross-cultural aspects of eating disorders. Journal of Eating Disorders, 1(1), 1-4. Solmi, F., Hatch, S.L., Hotopf, M., Treasure, J. and Micali, N. (2014), Prevalence and correlates of disordered eating in a general population sample: the South East London community (SELCoH) study. Social Psychiatry and Psychiatric Epidemiology, 49(8), 1335-1346. Everyone experiences shame and guilt at times. While these emotions can be helpful in guiding our social behavior, they can also bring a lot of discomfort and even trigger depression and other psychological disorders, such as eating disorders. Let’s differentiate between shame and guilt, describe in which situations they can be useful or harmful, and discuss how to cope with them. Guilt is an unpleasant emotion about something we have done. It is often used synonymously to remorse, meaning that we regret the action, and guilt may involve sadness and empathy towards the person harmed. Guilt is generally seen as a useful emotion that encourages us to follow moral and societal norms. For example, we may feel guilty about lying to a friend or skipping a volunteering shift at the local shelter. Guilt may also occur if we act inconsistently with our personal values. For example, someone who values family above all else may feel particularly guilty about skipping a family holiday dinner. In contrast to guilt that involves feelings about an act one has done, shame involves negative feelings about oneself. Shame encompasses a feeling of inferiority and perceiving oneself as a small, lesser person, worthless, and a failure. Another way to differentiate guilt and shame is by what the emotion urges us to do: guilt usually triggers a desire to apologize and redeem oneself, while shame may lead to a desire to hide or escape. Although shame can be helpful in some situations (i.e. serious wrongdoing) and is used in programs redeeming violent offenders (Loeffler, 2009), it generally is associated with increased distress and may lead to depression, self-harm, and disordered eating (Muris, 2015). Feelings of guilt can also be harmful if it is based on an irrational belief, such as feeling guilty for something that was not our fault. For example, if we witness an injustice, we may feel guilty because we think we could have done something to prevent it. Guilt can also transform into shame if a “bad” action is interpreted as having occurred because one is a “bad” person. Example: “I feel guilty that I didn’t visit my family this month” can lead to two different outcomes: 1) Call or visit the family to release the guilt or 2) Feelings of shame because “I am a bad son.” The problem with feeling shame in the second scenario is that it may lead the individual to further avoid visiting family and feeling even more shame. How then can we cope with guilt and shame? First, check your guilt or shame statement for accuracy. Was it really your fault? Can you think of anyone or anything else that may have contributed to the situation? Make a list of any other possible causes and state how much you think each cause contributed in percentage. Then add up all the percentages and subtract from 100%: How much is left? You may want to do this exercise with someone else who can help you see all the perspectives. To cope with shame, it can be very helpful to examine the evidence and rewrite shame statements into statements of guilt. For example, if you got frustrated and yelled at your child, does it really mean that you are a bad parent? Generally, we want to change the statement from “There is something wrong with me” to “I have done something wrong.” Most of the time, a guilt reaction is more accurate than shame. Statement of shame: I yelled at my child again! I am a terrible parent. Statement of guilt: I feel guilty about yelling at my child. What if you truly have done something bad and can’t shake the regret or shame? Think back to the situation and answer these questions: What purpose did this action serve to you at the time? What did it help you accomplish? What would have happened if you didn’t make that choice in the moment? It’s easy to see what we did wrong looking back and knowing what we know now; it’s called hindsight bias. Most often, we make the best decision based on what we knew at the time. Finally, if logic and reason are not helpful in dealing with guilt and shame, practice self-compassion. Most of us are very good at being compassionate towards others, but find it hard to be compassionate to ourselves. Self-compassion entails being warm and understanding toward ourselves when we suffer, fail, or feel inadequate, rather than ignoring our pain or beating ourselves up with self-criticism. Imagine that your close friend or a loved one tells you about their guilt or shame, what would you say to them? Say those words to yourself. You can also find many useful self-compassion exercises on Cristin Neff’s website http://self-compassion.org. Consider this: a friend or peer of yours has developed a particular obsession with food – to the point where they count the number of bites they take from their meal, or arrange their food in a specific way every time they eat. They might also have to eat their food in a methodical way and refuse to eat certain foods. This information alone might make you suspect that they have an eating disorder, but these symptoms could also be seen in another mental illness – obsessive compulsive disorder (OCD). Obsessive-compulsive disorder is characterized by repetitive, intrusive thoughts, feelings or sensations that cause anxiety, often accompanied by the need to engage in a repeated habit or ritual that serves to reduce this anxiety in the short-term. Similar to eating disorders, there are also various types of OCD, and the obsessions and compulsions can range from a variety of different things – from health to religion and sexual orientation. Eating disorders and OCD are often heavily stereotyped in the media. While you may immediately think of a teenage girl with anorexia nervosa when thinking of an eating disorder, or a person excessively washing their hands when thinking of OCD, the reality is that both these disorders affect individuals from both genders from a wide variety of different backgrounds and across all ages. Unfortunately, these stereotypes could keep individuals with both these disorders from realizing that they even have the disorder or recognizing the signs in their peers, and this keeps people from getting the treatment that they need. Stereotyping aside, OCD and eating disorders actually share a lot of commonalities. There are several parallels that can be drawn between these two mental illnesses. An example of an obsessive behavior that is seen across both these illnesses is checking. While someone with OCD may constantly check their stove or locks in their house, a person with an eating disorder may constantly check themselves in the mirror or weigh themselves frequently. This is no coincidence, eating disorders and OCD actually co-occur quite frequently (Rubenstein et. al., 1993; Halmi et. al., 2005; Swinbourne and Touyz, 2007) and eating disorder pathology has been shown to be positively associated with obsessive-compulsive symptoms (Davies et. al., 2009; Naylor et. al., 2011). In fact, obsessive-compulsive symptoms have also been associated with higher relapse rates in eating disorders (Carter, et. al., 2012). Individuals with OCD and eating disorders typically also share two traits in common – high levels of anxiety and perfectionism. In fact, it is quite common for individuals with these disorders to excel in various other areas of their life while silently suffering from the illness. Perfectionism may be seen as a positive trait by some, but it has been shown to mediate the relationship between OCD and eating disorders, and individuals with either or both of these illnesses typically have high levels of trait perfectionism (Bernert et. al., 2013). Additionally, obsessional anxiety could help maintain both OCD and eating disorder symptoms. This anxiety surrounds possible catastrophic outcomes that may occur if the ritualistic behaviors is not completed – in the case of an eating disorder, this could mean that an individual believes that, unless they heavily restrict, they will gain large amounts of weight and become overweight. In the case of obsessive-compulsive disorder, this could mean that an individual believes that they will die unless they are constantly avoiding germs and washing their hands. This anxiety leads to drawing associations between certain rituals and outcomes – even if they appear irrational to others. Not only are there common symptoms between eating disorders and OCD, but the treatment can also look similar. Specifically, exposure and response prevention therapy (ERP) is an evidence-based treatment that has been well established as the most effective treatment for OCD (Koskina et. al., 1996), and research is beginning to show that ERP may be effective in treating eating disorders as well (Ambramowtz et. al., 2013). Combining exposure therapy with cognitive-behavioral therapy (CBT) is effective in breaking up these irrational associations between ritualistic behaviors and the reduction of anxiety. It is important to note that, of course, eating disorders and OCD, are two very different illnesses. The obsessions and compulsions of an individual with OCD can extend far beyond food, and individuals with eating disorders often experience symptoms that are not typically present in OCD, such as body dysmorphia and drive for thinness. However, it is important to understand the relationship between these disorders, particularly as the comorbidity rate is so high. So, if you do question whether a friend or peer has an eating disorder or OCD – consider the possibility that it could be both! Halmi, K. A., Tozzi, F., Thornton, L. M., Crow, S., Fichter, M. M., Kaplan, A. S., et al. (2005). The relation among perfectionism, obsessive–compulsive personality disorder and obsessive–compulsive disorder in individuals with eating disorders. International Journal of Eating Disorders, 38, 371–374.